Timmy the scrub jay (Bureau of Land Management). A little bourbon was required for the planning process. If Internet-based crowdfunding had been available in the mid-1990s, we might have gone for it. Our spokes-bird was going to be Timmy the Scrub Jay. 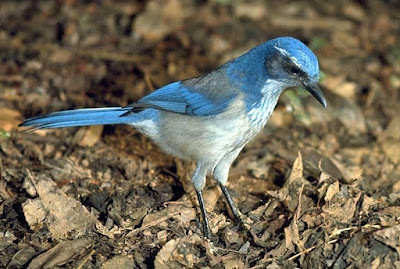 Western scrub jays are far from endangered, but we hoped that donors might confuse them with the Florida scrub jays, which are. In the long run, the only result was that around here, all scrub jays are named Timmy. Meanwhile, wheels were turning at the American Ornithologists' Union. All this time, Timmy had been under the impression that he was a Western scrub jay. But as of this summer, he is a separate species with a new name: Woodhouse's Scrub [hyphen] Jay. He is very pleased with his new surname. He might put up a "Don't Californicate Colorado" sticker. He is indifferent to whether you capitalize Scrub-Jay or not, as he favors neither an Audobon-ish "up style" nor an Associated Press "down style." He does, however, favor acorns and sunflower seeds.